Carbaryl—Eradicates native ghost shrimp and could harm other benthic species. Known to adversely effect salmon. Imazamox—Eradicates Zostera japonica eelgrass, but is known to also eliminate nearby native eelgrass. Adverse effects on other aquatic vegetation are not documented at this time. Imidacloprid—Eradicates native ghost shrimp and could harm other benthic species. Linked to bee colony collapse disorder and subject of bans in other countries and states. *Aquat Toxicol. 2013 Mar 15;128-129:67-78. doi: 10.1016/j.aquatox.2012.12.002. Epub 2012 Dec 10. Effects of glyphosate-based herbicides on embryo-larval development and metamorphosis in the Pacific oyster, Crassostrea gigas. Mottier A1, Kientz-Bouchart V, Serpentini A, Lebel JM, Jha AN, Costil K.
These presentations were given before the Pierce County Hearings Examiner in September, 2014. 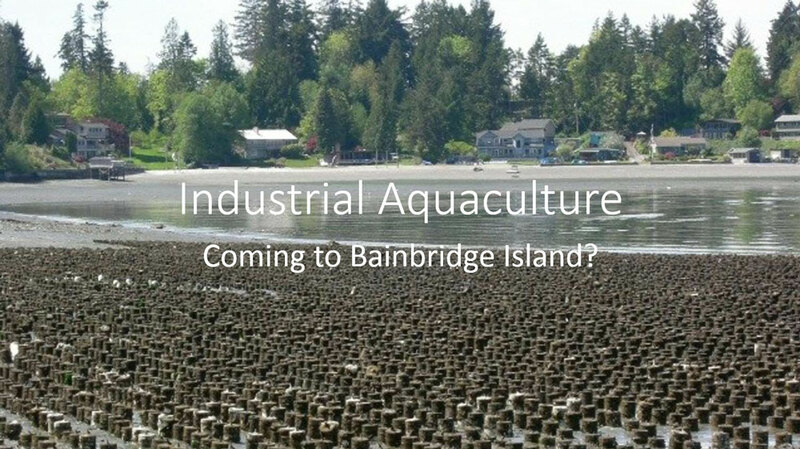 The Washington State Department of Ecology has substituted greatly weakened regulations on commercial aquaculture in the Bainbridge Island Shoreline Master Program update. After four years of work by citizens, the city’s Planning Commission and City Council, the Department of Ecology required changes in the SMP to allow industrial aquaculture on almost 100% of the island’s shorelines. A group of concerned Bainbridge Island residents thinks this is not right. 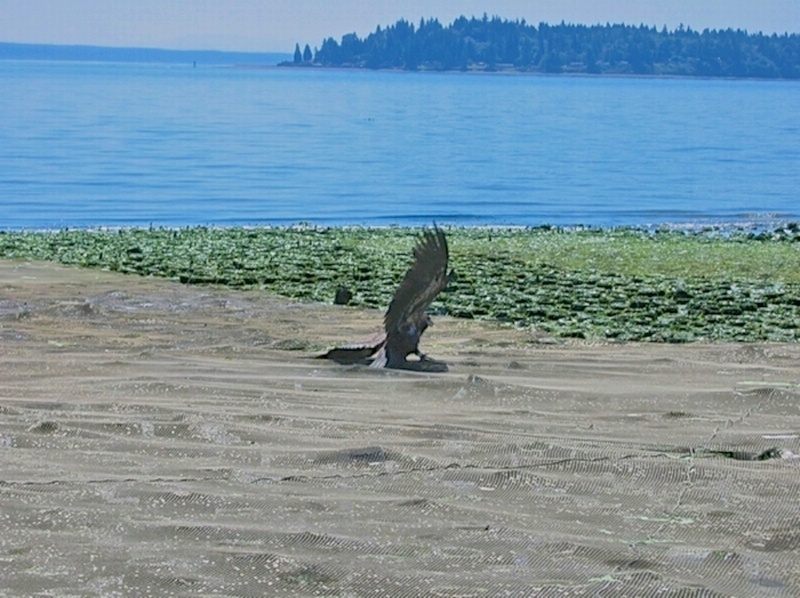 Bainbridge Island community members are the first shoreline community to appeal Ecology’s overreach. Here is a powerful and informative presentation they have produced. You must see what’s happening! Here, also, is the legal petition filed by the Bainbridge Alliance for Puget Sound, the Association of Bainbridge Communities, and the Coalition to Protect Puget Sound, to the Central Puget Sound Growth Management Hearings Board. Donations are being sought to support this appeal which seeks to help protect Puget Sound from extensive encroachment of intensive aquaculture. Checks made to Coalition to Protect Puget Sound Habitat (a 501(c)3 organization) should be mailed to Bainbridge Alliance to Protect Puget Sound, 321 High School Rd NE, Ste. D3, PMB #149, Bainbridge Island, WA 98110. Read WA Shellfish Initiative documents here. Washington tidelands are under covert attack by the shellfish industry as they implement the industry created State Shellfish Initiative supported by Governor Inslee. This 2011 initiative, intended to subvert our constitutional rights, silences citizen’s concerns and limits the right to litigate as industry takes over our shorelines for industrial aquaculture use. The U.S. Dept of Commerce/NOAA marched in at the request of industry to facilitate unlimited expansion sprinkled with minimal restoration. The plan includes “incentives/rewards” for counties that issue the most aquaculture permits. The Army Corp has issued over 900 aquaculture permits since January 2012. “Streamlined permitting” has been approved to intentionally weaken environmental and social protections afforded by the Clean Water Act, Endangered Species Act, the Shoreline Management Act and the Public Trust Doctrine. 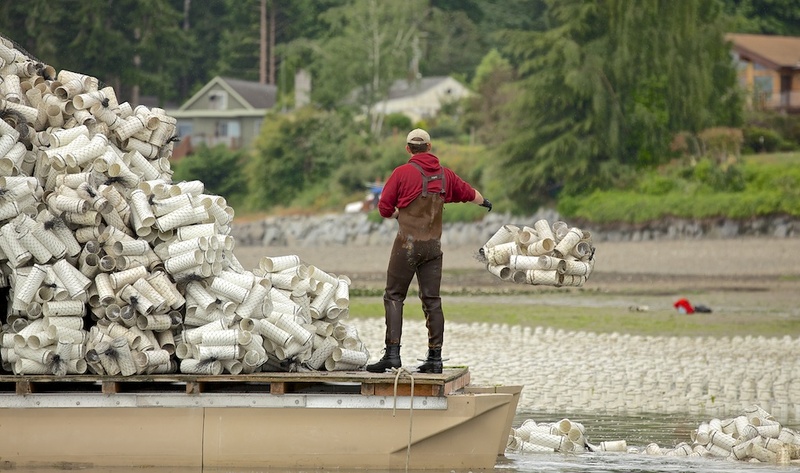 One of the outlined duties for the Washington Department of Ecology, as a sub-agent of the shellfish industry, was to facilitate County Shoreline Master programs that allow industrial aquaculture in all shoreline designations including the most pristine natural areas. As part of this plan, Grays Harbor was the first county to pass a Right To Farm ordinance on New Years Eve day. This ordinance was designed to prevent concerned citizens from filing lawsuits against the shellfish industry as their practices in residential areas include aerially spraying pesticides, excessive noise, odors and degrading marine plastic pollution. Unlike agriculture, these are public waters that are protected by the Public Trust Doctrine. Public safety has been ignored along shallow shorelines as industry continues to add thousands of canopy nets which catch boat props and harm swimmers, scuba divers, aquatic animals and birds. Public health is at risk when the public is not informed that Vibrio vulnificus, a deadly bacterium, was detected last year in Puget Sound oysters. The biological diversity of Puget Sound and our coastal bays are threatened by industry’s degrading water quality from the use of pesticides, industrial activities and miles of plastic pollution from toxic PVC and other plastics. 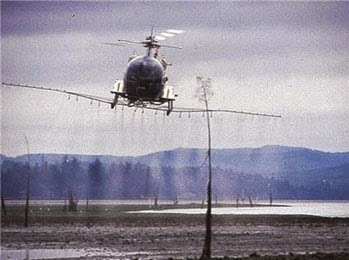 Willapa Bay, the largest producer of aquaculture in Washington State was referred to as a “chemical soup” by the Washington Attorney General as part of the legal argument to continue pesticide spraying. 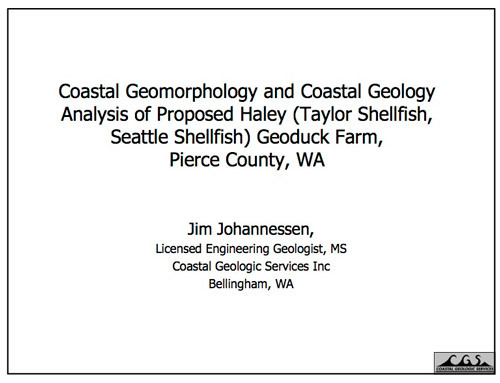 Shellfish growers are now requesting aerial pesticide spraying in Puget Sound over tidelands. Because of the high potential for unethical conduct, the Coalition To Protect Puget Sound is referring this issue to the State Executive Ethics Board and State Auditor. We are also requesting the Washington Department of Ecology and the Governor provide a copy of the SEPA required Environmental Impact Statement that has not been produced in public records requests. Our state is not in compliance with funding schools, so we should not be using scarce public funds to support a special interest group that pays minimal taxes. PCC Natural Markets has also questioned the sustainability of industrial aquaculture. Read More. The Coalition To Protect Puget Sound Habitat has filed an administrative Rule-Making to Amend Petition with the Governors Office requesting that Jay Inslee take the necessary action to direct the State Weed Board to initiate rule-making to delete Zostera japonica (Japanese Eelgrass) as a Class C Noxious Weed. Despite objections from numerous scientists, citizens, Washington Department of Fish and Wildlife and the Department of Natural Resources, the Weed Board’s Class C Noxious Weed listing includes all Washington waters including Puget Sound. Zostera japonica was listed as a noxious weed at the request of large corporate shellfish growers demanding that they be allowed to eradicate Zostera japonica in Washington waters without limits. The State Weed Control Board ignored the significant ecological benefits that outweigh industry’s unsupported claims that Z. japonica reduces their revenues and expansion. The shellfish industry is now requesting that Ecology issue NPDES permits to spray the pesticide Imazamox in Washington waters as early as this April with the public comment period ending February 15. Sierra Club has encouraged citizens to voice their opposition to this proposed spraying as well as the shellfish industry proposed spraying of Imidicloprid, a known bee killer . As outlined in this appeal, the Coalition has stated that the Weed Board should not be allowed to violate existing county, state and federal laws that afford protection for both non-native and native eelgrass. 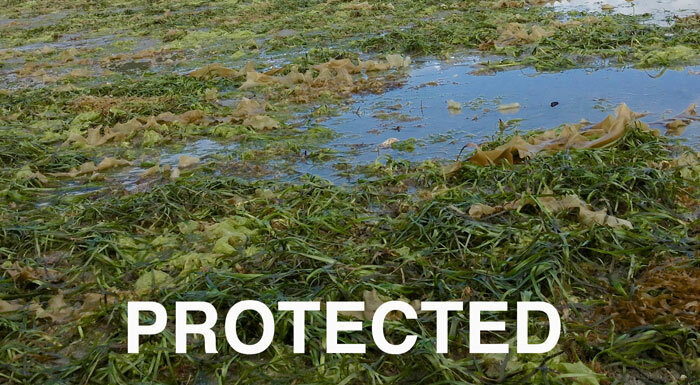 The proposed eradication documents clearly show that adjacent native eelgrass will also be damaged or eliminated. 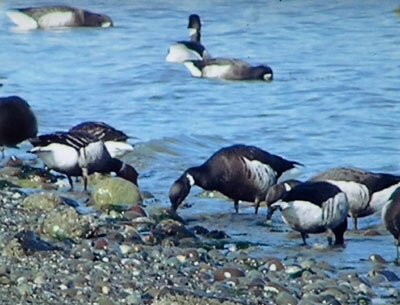 Food sources for hundreds of thousands of migratory waterfowl, cover for salmon smolts, vegetation that supports invertebrates and herring spawn medium will also be collateral damage. The Governor should require a cumulative analysis on this issue since: A new peer reviewed study outlines the need for a non-political analysis of Zostera japonica, a new peer reviewed study documents shellfish aquaculture increases nutrient production in estuaries and harmful algal blooms, seagrasses/eelgrass may reduce effects of sea change and acidification, a new State SHB Pierce County aquaculture ruling required a cumulative impacts analysis and toxins are already a serious concern with Washington shellfish. One State Agency nor Ecology should be allowed to ignore environmental and human health concerns at the demand of one industry. The Shorelines Hearings Board for the State of Washington overturned the Pierce County Hearings Board decision allowing geoduck aquaculture. (“Piece County’s issuance of SSDP No. 35-05 is REVERSED and the permit is therefore DENIED”). The permit was denied by the Board based on a lack of analysis of ecosystem services, cumulative impacts and other issues such as impacts on other human uses of the waterfront. 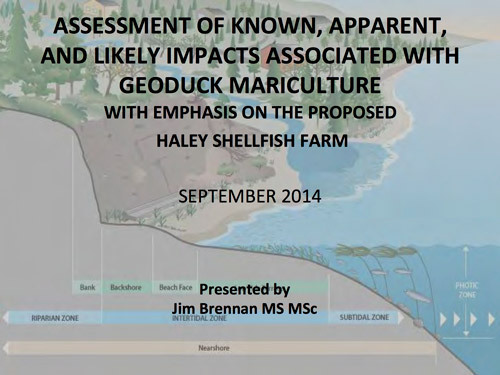 The burden of proof is now on the industry to demonstrate that geoduck aquaculture does not have cumulative impacts and does not impede ecosystem services. This important decision comes at a time when Washington shellfish have been banned in China and the European Union due to human health concerns and a new peer reviewed study states that shellfish aquaculture, finfish aquaculture and shrimp aquaculture may contribute to coastal nutrient enrichment and harmful algal blooms. Meeting the challenge of ocean acidification will require action at a level not yet seen from government, industry and individuals, write guest columnists Jay Manning and Bill Taylor. THE Seattle Times’ recent outstanding series on ocean acidification “Sea Change” stands as an uncomfortably vivid warning that our marine world — and the economies and lifestyles that depend on it — is under siege. The images of coral reefs and oyster larvae ravaged by ocean acidification provide haunting notice to Northwest residents of the consequences of inaction. Ocean Acidification and Northwest Shellfish: Did the Seattle Times Get the Story Right? Last month, the Seattle Times ran a glossy, three-part story called “Sea Change: The Pacific’s Perilous Turn” where it discussed the impacts of ocean acidification resulting from increasing CO2 in the atmosphere. The article made some strong claims that increasing atmospheric CO2 and the resulting acidification of the oceans and coastal waters were causing acute problems today for the shellfish industry in the Northwest. The third part of this series described how oyster larvae grown in Northwest shellfish farms had high mortality in 2005-2009, mortality that the ST blames on CO2-induced acidification of the coastal ocean by the atmosphere. As I read the article I became increasingly concerned with contradictions within the story; furthermore, some conclusions did not appear to be supported by scientific evidence. Since then I have read a number of relevant articles on the subject and have talked to some local experts. My conclusion is that this series has some serious problems and draws several unwarranted conclusions. Particularly that recent shellfish problems are the result of past or current CO2 levels in the atmosphere.